Please join us for Kansas BEST Game Day at Koch Arena on Saturday, October 20, 2018. 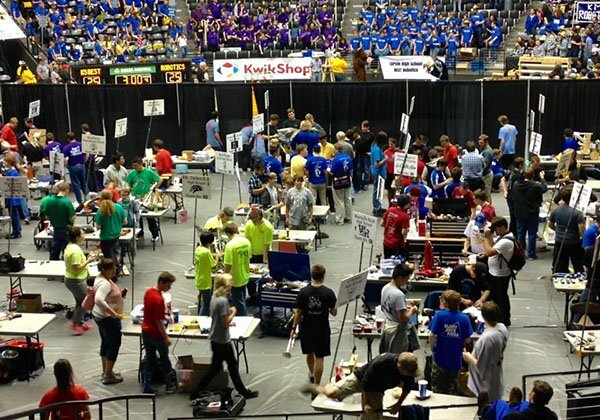 Over 500 students from 32 teams will participate in this year's competition. This event is free and open to the public! The Game Day activities will be streamed online by Atchison High School Video Productions! Buses should drop-off teams on the south side of the Charles Koch Arena (Lot #2W). Teams can park buses and personal vehicles in either lot 2W or 2S, located west/southwest of Koch Arena. Entrances are on the northside of lot 2W, with access from 21st Street, or on the westiside off northbound Hillside. If you have questions about the Game Day event, please contact Jason Bilberry at (316) 978-3159 or jason.bilberry@wichita.edu.